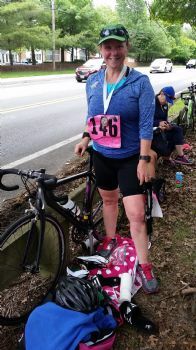 Yesterday, I completed my first triathlon! It was a small sprint tri, and I did better than I expected.... but even better, I love the way it made me feel! Strong, powerful, accomplished... I think this is what ONEKIDSMOM calls "the awesome." This is not my first endurance event, I've done a few HMs, and many 10 mile races. So the feeling is not unfamiliar. But this was even more exciting. I'm not sure what it was, all the different challenges of doing 3 different events, the strategic component or the thrill of finishing with a really strong run... whatever it was, I was smiling ear to ear! The event was an 800 yard pool swim, 9 mile bike ride and 5k run. The bike ride was no counted because it took place on a trail which has a speed limit, but adding the official time (swim, run and transitions) to the bike time from my Garmin watch, I came in just over 1:45, which was 10 minutes faster then I expected. I was exactly in the middle of my age group, so lots of room to grow! The swim started out really badly. I forgot to put my goggles down over my eyes and I couldn't figure out what was wrong. What a rookie mistake! But then again, I am a rookie.... and swimming is not my strength. I also reacted badly to the chlorine - I've been training in a salt water pool - and was actually gasping for air at one point. And I thought, what if this was open water? Could I do this? Am I done before i start? And then I said to myself no, you can deal with this. And I used my mental strength to pull myself together., I thought, if this was open water, you would roll over and float or swim on your back until you caught your breath. And I put my goggles on and did breast stroke for half a lap while I calmed myself. And then I reset my Garmin watch - somehow it had stopped counting laps during all this = and estimated that I had done 6 laps at that point, and started again slowly, and continued on my way. And I was fine after that, picking up speed as I felt more comfortable. And I finished the swim. My transition to the bike was not too bad, I had my bike stuff laid out on my mat. I could have been a little more organized, but I got it all together and remembered to fuel up and I got going on the bike. I recently switched to clipless pedals - the ones where the shoes attach directly to the pedals, and I was pretty comfortable with them on the ride. Because in this race the bike portion is not counted towards the total, as it on a rail trail with a speed limit... so no need to rush! I paced myself to save energy for the run. The run was amazing... at 11:05/mile, it is the best pace I'e done in awhile (giving you pace time because it turns out the distance wasn't exact - this was a pretty casual race!). And funny thing, the hardest part of a tri is going from bike to run. And it was hard, my legs felt, as advertised,like bricks. BUT funny thing, I was running significantly faster than my normal pace (12:00 minute mile lately), and it was not hard to keep moving at that pace. I noticed this when I did "brick" training sessions too, and I guess it's because my legs are used to turning over quickly on the bike, so they just kept going. It's possible that it would have been different if I had pushed harder during the run, I guess we'll see in the next event. I was totally pumped when I finished - what a feeling! My husband was awesome, really a great support through training and the race... what a guy! And the high lasted all through the day and into today! It's a good thing I got through the swim, because I've already signed up for my next race! Hampton, Virginia in July!. It's a 500 meter open water swim from a beach into the Chesapeake bay, 10 mile bike ride and 5K. Training starts tomorrow! More on that later, for now I am savoring the victory! Congrats on a great race! You did your prep and executed race day, two of the most important things. I'm so happy for you that you had a great time and felt "the awesome". Way to go!!! Congrats! Well done! You are amazing and I am proud of you. Yippeeee!!! Congratulations! What a great accomplishment. So impressive. I love that picture. You are just radiating joy! Thanks for sharing your experience! Here's to Hampton! Bask in the glory! Has to be an exhilarating feeling, eh?